Note: URLs change quickly and get out of date way too easily, so although I try to check these links every month or two, they may not always be correct. The Official California Home Page. What the state wants you to know about itself (“Recommendations from the Regulatory Roundtable”, etc.). Some very useful and interesting information in the pages rooted here. There’s also a new mobile phone version of most of this web site available now. The California Department of Motor Vehicles (DMV). The people in charge of giving you a driver’s license, registering your car, etc. Includes links to the official driver’s handbook in English or Spanish (you can also download a PDF version). Caltrans. The California Department of Transport’s home page. Links to everything from weather info to interactive maps to route planners lurking under here. The California Division of Tourism‘s official home page. A useful starting place for general tourist information. The US Geological Survey’s Earthquake Preparedness site — a good official guide to quake hazards, what to do when one happens, etc. You ought to know this stuff if you’re coming to Calinfornia, even if it’s just for a short stop-over. 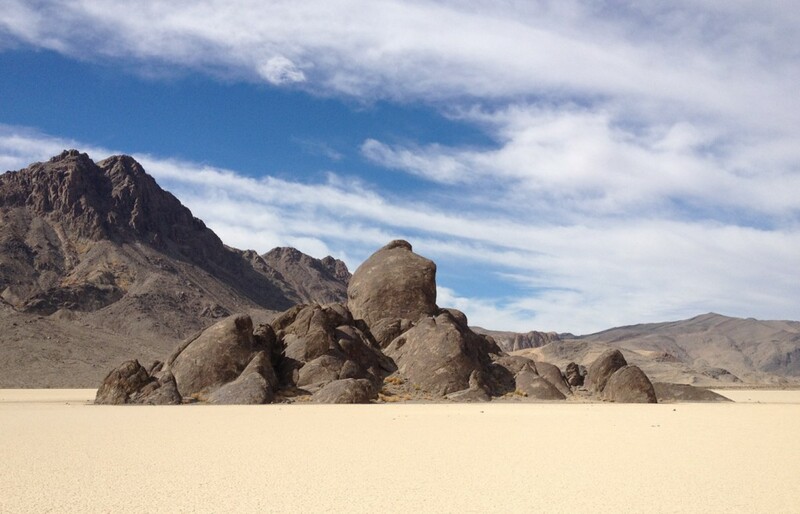 The wonderful Mojave Treks site, “[…] a chronicle of our personal travels in the California, Nevada, and Arizona deserts, as well as a guide for those new to desert travel or those looking for new places to explore”. Death Valley Jim’s site, a good guide to some of the more interesting and unusual bits of the desert (and more) by adventurer, author, guide, and photographer “Death Valley Jim”. The official Caltrans Highway Conditions page. Up-to-date (24 hours-a-day, 7 days a week) information on all highways, freeways, etc. maintained by Caltrans (also available on 1-800-427-7623 as a phone service). The Metropolitan Transport Commission’s San Francisco Bay Area Transit Information home page (www.511.org), a very useful resource for getting around the Bay Area. Everything from BART and ferry schedules to all the major public and private transport alternatives for the area. Very extensive; really useful for planning a non-car trip (hey, it can be done in the Bay Area. With a bit of luck and a lot of fortitude…). BART — the Bay Area Rapid Transit system. A very useful reource if you’re a tourist or traveler in the Bay Area and you can get to and from BART. San Francisco Muni, the local tram (streecar), bus, and cable car system in San Francisco. Indispensible if you’re trying to get around the The City. The official National Weather Service Western Region weather site. Covers the entire western UA, but you can zoom in on the bits of California you’re interested in. Everything from simple everyday weather forecasts to excruciatingly detailed aviation weather reports under here somewhere…. The US National Park Service home page. A really informative and useful set of pages covering all of the US’s national (Federal) parks. The Yosemite National Park Home Page is particularly good (and very relevant to California Driving…). The US Forest Service home page. This site explains things like national forest use permits, fees, access rules, etc., and has individual home sites under it for all the various national forests in the US, including (of course) California. (The USFS is very similar to the NPS, with rangers, etc., but the land under their control is less protected from commercial use). The California State Parks web site. Another parks and wildlife site, this time for California’s state parks, which are usually smaller-scale versions of the national parks, with rangers, etc., and all sorts of facilities ranging from beaches to hiking trails to horse riding, etc. Virtual Guidebooks — as it says, “This site features over 2100 virtual reality panoramas. These amazing photographs show you exactly what it is like to be in that particular spot — you can look in any direction, as well as up and down, and zoom in and out. It’s the next best thing to being there”. Really very good (if you have Quicktime) — particularly take a look at the California pages on this site. The California State Automobile Association (CSAA). The main American Automobile Association (AAA) affiliate in Northern California, Nevada, and Utah. The California State Automobile Association (CSAA). The main American Automobile Association (AAA) affiliate in Northern California, Nevada, and Utah.The Automobile Club of Southern California. The South State AAA affiliate.